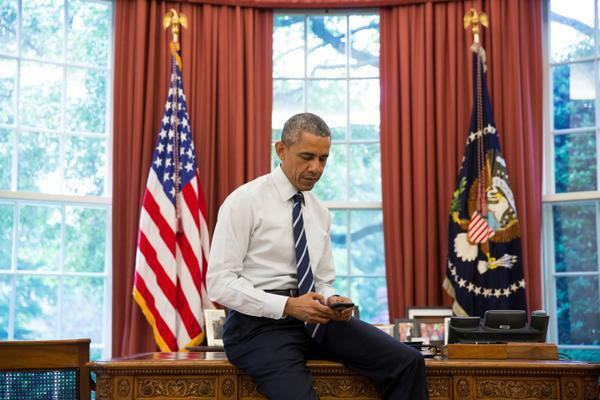 After six years in office, another social media first for the Obama White House. Obama tweets. (Image via the White House's Twitter account). Another self-described dad and husband joined Twitter on Monday, but this one had a more noteworthy third descriptor in his bio: 44th president of the United States. Barack Obama, with the username @POTUS, celebrated another milestone six years into his presidency with his first tweet. In little more than an hour after his first tweet, Obama was closing in on 400,000 followers. He is only following a few dozen other users, including his beloved Chicago sports teams, federal agencies, members of his administration, former presidents, White House staffers, and his wife, who welcomed him to the platform. The White House, which has used digital media to get its POV across in unprecedented ways from Reddit Ask Me Anything sessions to interviews with quirky YouTube tastemakers, confirmed that tweets from @POTUS will be Obama’s alone. "President Obama is committed to making his administration the most open and participatory in history, and @POTUS will give Americans a new venue to engage on the issues that matter most to them," the White House said in a blog post. Staffers from Organizing for Action, and previously the president’s campaign staff, tweeted on his behalf using the @BarackObama account, with tweets directly from Obama signed "-bo." Twitter users – including an NBA legend – welcomed the leader of the free world on Monday, or seized the opportunity to crack a joke. If I were Obama I would just keeping using @POTUS forever so Hillary has to register @__President_H_Clinton_45_White_House or something. Smart move by person who set up @POTUS account to follow all Chicago sports teams except @Cubs . Staying very on-brand as a @whitesox fan. Know your Twitter accounts: @POTUS is the President. @whitehouse is the institution. @BarackObama is run by OFA; it's a campaign account. This story was updated on May 18 to correct the name of the group operating the @BarackObama account. It is now known as Organizing for Action, not Organizing for America.